This period covers the establishment of St. Mary's Parish. The first Polish immigrants into Reading came from the area of Poland known as Poznan. Because Poznan was frequently under German control, most residents of the area spoke German as well as Polish. At that time, in the history of the Church in the United States, almost all parishes were based on a particular ethnic population. When these immigrants came to Reading, they naturally attached themselves to a parish, St. Paul's, that served the needs of German-speaking Catholics because there was no Polish Church in Reading. The pastor of St.Paul's, Father and later Monsignor George Bornemann, actively sought out Polish-speaking priests to serve the needs of Reading Polonia. Eventually, a Father Emil Kattein became the assistant pastor at St. Paul's. Father Kattein studied Polish while in Reading, but was then selected in 1882 to be the founding pastor of the first Polish-speaking parish in Philadelphia, St. Laurentius (Lawrence). When Father Kattein left St. Paul's, no Polish-speaking priest was assigned to take his place. Father Bornemann continued to look after the spiritual needs of the fledgling Polish community. In January of 1888, Father Victor M. Lebiecki was appointed assistant at St. Paul's. Father Lebiecki took on the task of establishing St. Mary's Parish and its first church, which became the basement of the present church. 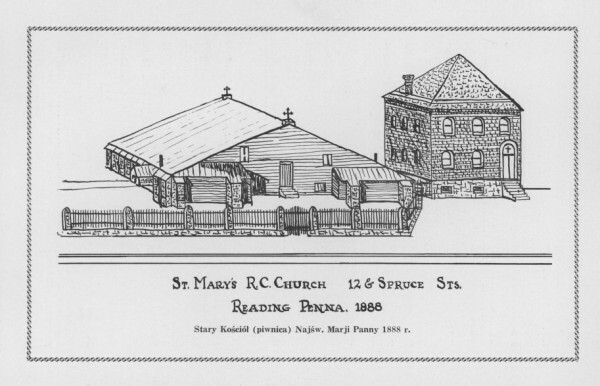 Supposedly, there were 300 souls in Reading's Polish community, However, only 180 of them were financially supportive of the proposed venture, which called for the immediate building of a church approximately the size of St. Paul's. It quickly became apparent that the larger church would have to wait. But, there were bitter fights over whether to build immediately or be content with a basement church. The smaller faction repeatedly electing "presidents" of the parish congregation - something unheard of in the annals of Catholicism. Once the basement was dug and put under a roof, a cornerstone-laying ceremony was arranged. The assembly gathered around Archbishop Patrick J. Ryan of Philadelphia and the clergy present on the roof of the basement. The weight of the people proved too much and at the very start of the sermon, the roof caved in. One woman was killed and many people were injured as they fell into the basement. This tragedy greatly affected Father Lebiecki and he left Reading in November, 1888. Father Lebiecki was succeeded as assistant at St. Paul's by Father Mark Januszkiewicz, who oversaw the repairs to the basement church. This basement church probably took up the same space now occupied by the chapel and the meeting room. In time, probably in April, 1889, Father Januszkiewicz was named the first pastor of St. Mary's. He arrived in Reading in November, 1888. 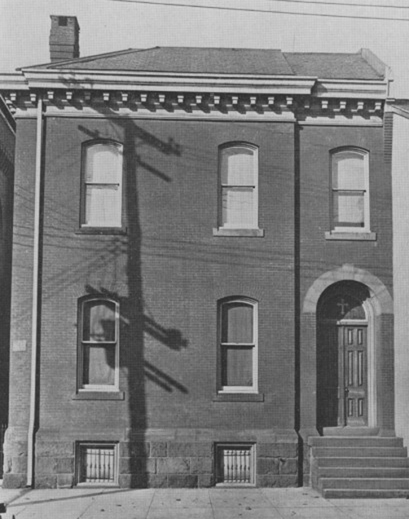 He built the original rectory for St. Mary's at 236 South 12th Street (the present parking lot on the left side of the current church). Father Januszkiewicz lived on the second floor of the Rectory; the first floor served as a school. The Schoolmaster, following the practice of the time, was also the Church Organist. The times were difficult and there was a great deal of friction between the pastor and the parishoners. In August, 1894, Father Januszkiewicz left St. Mary's to become the pastor of the then-combined Polish parishes of McAdoo-Mahanoy City. Father Matthias Tarnowski became pastor of of St. Mary's in 1894. Before coming to St. Mary's, he was the founding pastor of St. Casimir Parish in Mahanoy City (1893-94), In 1895, Father Tarnowski exchanged places with Father Adalbert Malusecki, a future pastor of St. Mary's.